He's persuasive, charming, and way too mysterious. And for Samara Marshall, her co-worker is everything she wants most--and everything she most fears. . . But Caleb's secrets are drawing Samara into a world where the laws of attraction are a means of survival. And as a sinister power closes in on those she loves, Samara must take a risk that will change her life forever. . .or consume it. Ok, I will be honest when I say, I thought this was going to be a copy cat of Twilight or some other YA vampire book. I will start by saying- this book is not about vampires. It is not a copy cat of Twilight either. Samara Marshall is a fun and different heroine. She is feisty, opinionated, and sure of herself. She is not the meek or mild heroine that seems prevalent in YA paranormal romances. Samara works at a local bookstore where she meets and gets to know Caleb Baker. Caleb feels like a realistic teenage boy- he doesn't have all the answers. He is strong, but isn't perfect. The characters are what really shine in this book. Even the minor characters and friends have vivid and realistic personalities. I was a little unsure about this book. Although demons seem to be popular in YA fiction, I hadn't really read much about incubus and succubus demons inhabiting bodies. This was a different way to take the demon trend and one I appreciated. I will say, the book NAILED the last few chapters- it really built drama steadily and at the end wowed me with an amazing action sequence and a twist that blew me away. I am really looking forward to reading the next book in this series! 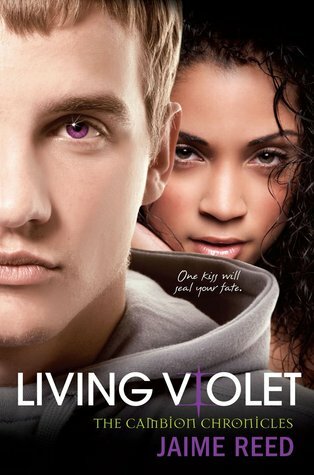 Do you want a chance to read Living Violet? Go check out my giveaway here to win yourself a copy! I'm glad you gave it a positive review. I am very interested in this book and want to read it. I have learned that you can't compare every paranormal romance to Twilight.